BRIGHTON’s Community Blitz was officially launched in style in June with some fantastic blitzes that made a lot of people in the community very happy. The first Big Blitz included a makeover of the PCYC community garden and the installation of some bright, colourful murals created by young people during the PCYC school holiday program and students from the Jordan River Learning Federation Middle School Student Representative Council. 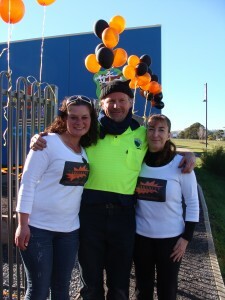 From left, Tennille Murtagh, Community Blitz coordinator Peter Griffiths and Natilea Lovell. BRIGHTON Council is proud to be able to develop this innovative program to assist people to buy brand new homes through the establishment of the Brighton Industrial and Housing Corporation. A MAJOR affordable housing development launched in the Brighton municipality will deliver a $300-million boost to the Tasmanian economy. The project is an initiative of the newly formed Brighton Industrial and Housing Corporation (BIHC), a not-for-profit company owned by Brighton Council, and will provide an immediate stimulus to the depressed housing and construction sector. 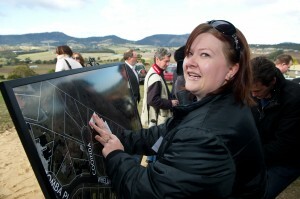 House and land package purchaser Leonie Jenkins looks at the block she has chosen. It will also bring the dream of home ownership to reality for people caught in the rent trap who previously were unable to purchase a house, with house and land packages available for around $220,000. If financed through the State Government’s HomeShare program, this means weekly repayments could be as low as $285 a week at the present interest rate of 7.1 per cent. This major development has been initiated by Brighton Council in partnership with the State Government and is aimed at significantly increasing private home ownership in the local community. It involves the construction of about 400 new affordable homes in Bridgewater, Gagebrook and Herdsmans Cove, on large parcels of currently under-utilised Council and government-owned land. Special funding packages provided by both Brighton Council and the State Government will bring these homes within reach of many who are paying market rents. It’s estimated that the project will generate more than $100 million in direct economic activity. Using the standard Australian Bureau of Statistic’s multiplier for the construction industry, the total direct and indirect economic output of the project is valued at about $300 million. Brighton Mayor Tony Foster said the project would benefit employment and the housing and construction sector, create attractive options for prospective homebuyers and provide a major boost to the state economy. “This is an extremely exciting project for Brighton and Tasmania and is part of Brighton Council’s vision to increase private home ownership in our community through a private-public partnership,” Cr Foster said. “It follows the development report for Brighton authored by consultants – former Premier Paul Lennon and Nigel Reeves – that recommended the establishment of BIHC to maximise the economic and social benefits of under-used land in the municipality. “This project has the capacity to provide a life-changing opportunity for many existing renters in the Brighton community as well as make the dream of home ownership a reality for many others. Cr Foster said consultants had developed a sound financial model and external funding of up to $100 million had been confirmed through Tassie Home Loans. It would enable the development of house and land packages costing around $220,000. “Proceeds from land packages available now will be used to develop additional residential blocks, so driving the program without any upfront financial contribution from government,” Cr Foster said. “Combining Council and State Government land with innovative funding solutions will result in a greater number of affordable home packages and generate significant economic and social outcomes. “It will provide an immediate stimulus to the building and construction sector with a positive flow-on impact to other industries. Plans will be available and builders will be on site to discuss home options. Further information is available from Tassie Home Loans on 1800 687 377.